Photo: The Port of Mandahl project will include the first new hotel on St. Thomas in more than 20 years. (Photo courtesy of St. Thomas government website). 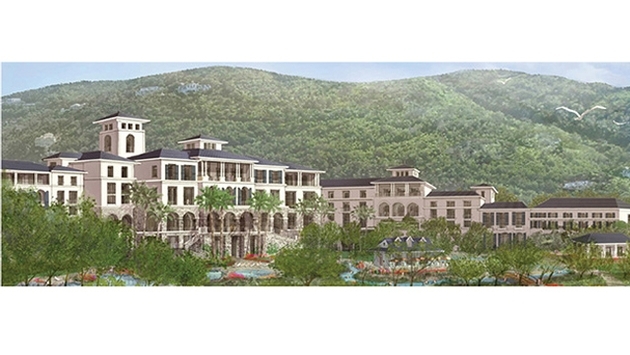 The government of St. Thomas signed agreements with Mandahl Bay Holdings Inc. Thursday to develop a $487 million resort development and community that will include the Caribbean island’s first new hotel in more than 20 years. John P. de Jongh, Jr., St. Thomas’ governor, signed the agreements at a news conference at St. Thomas’ Government House with principals of Mandahl Bay Holdings, a subsidiary of New York-based real estate firm Transcontinental Realty Investors Inc. Planned for St. Thomas’ north side, the development’s centerpiece will be a 300-room Hyatt Regency hotel, de Jongh said. Construction on the 400-acre development will begin in 2016 and take three years to complete. “The proposed Port of Mandahl development represents the first new hotel to be built on this island in more than two decades, but continues the efforts of my administration to ensure the territory remains attractive to guests [and] competitive with other locations, while ensuring jobs and business opportunities for our people,” de Jongh said Thursday. The project will also feature what de Jongh described as a “new community” on St. Thomas. “This project stands to enhance the profile of the Virgin Islands globally,” he said. The Port of Mandahl’s first phase will feature a 50-slip marina; private estates and marina townhouses; plus 48,000 square feet of retail and commercial space in addition to the Hyatt hotel. The second phase will include improvements to the Mahogany Run Golf Course, a 30,000-square-foot conference facility with a 10,000-square-foot ballroom for major events, a 5,000-square-foot junior ballroom and additional meeting rooms. Mandahl Bay Holdings will invest $209 million in the project’s first phase and an additional $262 million to complete the second phase. The developers will work with environmental consultants and the U.S. Army Corps of Engineers to meet environmental and regulatory requirements to create a new beach and protect existing coral reefs at the site, said project officials. DeJongh positioned the project as key to a reversing a recent tourism downturn in St. Thomas, whose tourist arrivals declined 4.7 percent in 2013 according to Caribbean Tourism Organization (CTO) statistics. “The lifeblood of the U.S. Virgin Islands is our tourism industry, and even with the recent private investments to broaden our attractions and government investments, we have had no new hotel or resort construction in the last 20 years,” added George Dudley, counsel to the developer. “The fastest way to grow the Virgin Islands' economy is through tourism, and our most immediate opportunity is to revitalize our tourism product by developing a major new tourist destination,” Dudley added. In addition to the hospitality development, the project will also create “near-term construction jobs, [and] an array of permanent jobs” while also establishing “an attractive destination [with] a competitive advantage,” said Dudley.